Simultaneously caring for your family and home is complicated, but owning a water conditioning system can help make everyday tasks around the house a bit easier. That’s because unconditioned, hard water contains harsh magnesium and calcium minerals that leave behind stubborn deposits and hinder soaps and detergents from performing effectively. By installing a water conditioning system in your home, you’ll enjoy an endless supply softened water that’s better suited to meet your family’s needs. You already have enough to worry about – don’t allow the effects of hard water to complicate your daily routine further. Cleaning dishes – Hard water prevents dishwasher detergent from effectively interacting with many types of food residue. Plus, as hard water users know well, magnesium and calcium minerals leave dreadful, cloudy stains on glassware. 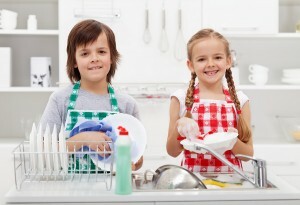 Using soft water is a great way to ensure your dishes come out of the dishwasher dazzling. Doing laundry – With soft water, your family’s clothes will feel softer and last longer after a spin in the washer. Hard water minerals linger on fabrics, making them appear dull and feel stiff. And since hard water inhibits laundry detergent from lathering and cleaning properly, you’re likely wasting money on pricey detergents without a water conditioning system. Washing skin and hair – If you shower or bathe with hard water, you’re exposing your skin to more than your favorite body wash. Hard water’s calcium deposits join with soap to create an invisible film that clings to your skin rather than produce bubbles, oftentimes drying it out and even causing irritation. Shampooing in hard water triggers a similar drying effect on hair. Instead of splurging on clarifying shampoos and oil-based soaps that work better in hard water, installing a water conditioning system will provide your family with a gentler, more effective option. Maintaining water-using appliances – Hard water causes stubborn limescale buildup in water-using appliances throughout the home, which can cut the lifespan of even the nicest dishwasher or laundry machine short. You could always set aside an afternoon to scrub the limescale away, but who has time for that? If you’ve grown tired of dealing with your home’s hard water, contact your local authorized RainSoft dealer today for a complimentary in-home consultation. RainSoft has provided quality whole house water conditioning solutions since 1953.